What is the visual story that needs to be told about Africa? Is there a pictorial strategy that can account for one billion people, living in 53 countries that occupy 12 million square miles, speaking two thousand languages, embodying multiple cultures and numerous ethnicities, with manifold intersections with our globalised wold? Would we even ask that question of the Americas, Asia or Europe? It is unlikely. Others are represented in ways designed to shore up the self and ‘Africa’ is central to the formation of European and North American identity. This process embodies colonial relations of power that distill a complex, hybrid place into visual stereotypes that cast people and their place as superior/inferior, civilized/barbaric, modern/traditional, developed/underdeveloped and so on. Photographing an American Marine with a malnourished boy during Operation Restore Hope. These stereotypes construct both conventional wisdom and its possible alternatives. Others can be reviled for their barbarity or exalted for the closeness to nature, but these options are no more than two sides of the same coin, and each distances ‘us’ from ‘them’. Binyavanga Wainaina’s satirical account of how (not) to represent Africa captures this dual operation, and news coverage often sees ‘Africa’ as a place of either human misery or natural exoticism. ‘Africa’ is therefore a mythic space, the quotation marks signifying its production. The visual story that needs to be told about ‘Africa’ is not a single story. It is a series of stories assembled to end the idea of a singular 'Africa'. We need accounts of complexity, contrasts, and diversity that are drawn from the everyday as much as the exceptional. We need reports that are aware of their own construction and understand how they either affirm or challenge stereotypes. There is plenty of photographic work that does that. It is too much to ask of each individual project that it ticks all the boxes, but what projects like African Lens can do is aggregate and curate the rich material being produced so that we can see how, in combination, these images enable stories that complicate the simplistic and deepen the superficial. we need to support new developments in the multimedia practice of photography that can literally give subjects a voice for their own stories. Government speaker at a political get together. 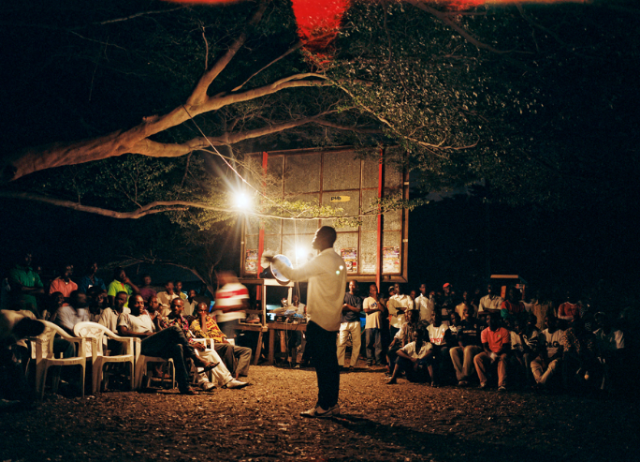 There are many recent photographic projects contributing to this re-visualization of ‘Africa’. Consider Joan Bardeletti’s work on the middle class in Africa alongside Finbarr O’Reilly’s story on white poverty in South Africa. Think of Andrew Esiebo’s portfolio of Lagos nightlife and Ed Kashi’s Niger Delta project, Michael Tsegaye’s pictures of working girls in Addis Ababa, Andrew Tshabangu’s documentation of Johannesburg and Marcus Bleasdale’s presentation of the Kimbangist Symphony Orchestra in Kinshasa to name just a few. The problem with stereotypes, as Chimamanda Adichie says, is “not that they are untrue but that they are incomplete.” Because of this, the new visual stories of ‘Africa’ cannot ignore the issues of famine, injustice, poverty and war. While we can sympathies with Paul Melcher’s cry for no more “dying Africans,” we must have visual accounts of atrocities when they occur. However, they have to go beyond the stereotypes, as with the Condition Critical project on the Congo war or the coverage of human rights issues in Burundi and Malawi. These are exciting times for visual storytellers, with the power of the web facilitating the global production and circulation of new photographic projects. There are many challenges involved in getting better stories to the right people, but the gatekeepers of the mainstream media no longer have total control over what we can or cannot see. If we appreciate how stereotypes have been produced and can be contested, we can, over time, achieve the re-visualization of ‘Africa’. This question has been on my mind for awhile. Is there a way to portray the problems of Africa without being stereotypical? Is that an unavoidable consequence of the severity of some of these issues? For those of us who are not photojournalists, we will appreciate examples of how hard subjects like this can be covered in a non-stereotypical way - something, perhaps to set a benchmark for how stories from Africa should be approached. ( Do we need a benchmark at all?). Steve - the point about the NGOs - So are they really helping to perpetuate this “desperate” need of Africa? The question is, is that the only tool they’ve got to raise money effectively? Photographers on the whole need to make money to survive. The only organizations usually willing to pay for their services are NGOs, most of whose needs are to raise money (within the capitalist framework) by showing the desperate state of the African majority. Their aim (the NGOs) is to help the poorest while not challenging the status quo (rich west, poor Africa). So, nothing changes….Africa, stereotypes, most photo stories….I could go on. Beautiful site!!! Job well done. I have shared this site with a few of my native African friends and I am sure this is going to spread worldwide. Thanks John! You have the honor of being the first to comment on the new site! Looking forward to your submission too! Congratulations, Victor! African Lens is off to a great start.